An outer trim kit can be added to help bridge the gap between the appliance and the surrounding wall. This lining kit from Napoleon comes in 2 pieces, and it can be used with 5 inch by 8 inch direct ventillation systems. Each kit includes a 5 inch by 5 foot aluminum liner, as well as an 8 inch by 5 foot liner. Each vent pipe is durable and can be used with Napoleon heating appliances. With this lining kit, you can help vent your fireplace without causing physically demanding projects or expensive renovations for your fireplace. This allows you to easily create a low cost solution for your ventillation needs. When installing a heating appliance in your home, using the right venting liner will affect the efficiency and safety of your appliance. Napoleon makes this liner especially for its appliances requiring 5-by-8-inch direct vent systems. When you use Napoleon's liners with their appliances, you can be sure everything will fit and function correctly. Each kit includes two flexible aluminum liners: one is 5-inches by 10-feet and the other 8-inches by 10-feet. Order this liner kit to properly install the venting for your Napoleon appliance. For venting situations where the vent system penetrates a below grade wall, Napoleon offers this snorkel periscope product as a solution. The periscope puts the vent connection exactly where you want it, without causing exposure or undue wall demolition for installation. If your gas appliance is from Napoleon, this vent will connect directly to the appliance, eliminating the need for any adapters or special connections. Ensure your gas appliance system is properly ventilated with this snorkel periscope. Many Napoleon direct vent appliances use the 5" x 8" direct vent pipe system. This coupler is used to join two sections of that pipe together when a longer vent is necessary. Since it is designed to be used with the Napoleon, you know that it will do its job properly and won't need any special modifications but can be used just as it is. Using parts that are designed to work together is one way to ensure the safe and effective operation of your vent and the heating appliance itself. Napoleon provides top notch fireplaces, fireplace implements, accessories and components, and having the right support network for your chimney piping is essential to your installation. This Flexible support assembly is for Napoleon direct ventilation applications, and is designed for use with 5 in. x 8 in. venting systems. Of course, Napoleon's venting products are compatible with other heating appliances as well, but are more efficient when used with their own product line-with less fuss and complication. If you looking to install a ventilation system you can count on, then look no further. This direct vent pipe Firestop by Napoleon is the exact component you need for your chimney as your ventilation lining system passes through ceilings and walls to protect the surrounding area from the high heat of your heating appliance. This chimney pipe firestop is designed for use with 5 in. x 8 in. direct vent systems. Napoleon chimney liner pipes and components will not only provide protection from chimney fires, but will prevent insulation from accumulating near the chimney piping, thereby safeguarding your home. This termination kit from Napoleon is made to create a quality termination for 5 inch by 8 inch direct vent systems from Napoleon. By purchasing the termination kit from the same company that made the fireplace, you can have an easy transition from your venting to your termination kit, and you can eliminate the worry that your vent won't fit with your termination kit. This kit creates everything that is needed to create a termination on roofs with a 1/12 to 7/12 pitch. This roof termination kit is for a direct vent chimney system. It is designed for pitched roofs between 8/12 pitch and 12/12 pitch. This kit will handle five inch to eight inch chimney venting systems. Manufactured by Napoleon, this kit will work perfectly with other Napoleon home heating and venting products. Of course this product will work with other brands, but you may need adapters and the installation may be more expensive and more complicated. The Napoleon Flat Roof Kit is designed to work with all Napoleon venting systems to help you finish all your venting projects quickly and efficiently. The trusted Napoleon brand that manufactures quality appliances is the same brand that can help you with all your venting needs. Terminating your venting on a flat roof sounds intimidating, but it doesn't have to be. Simple choose the Napoleon Flat Roof Kit and finish your venting job with a reliable and easy solution. If you want to use 5-inch by 8-inch DuraVent direct vent pipe with your Napoleon gas fireplace you're going to need a Napoleon W175-0170 DuraVent Direct Vent Pipe Adaptor. 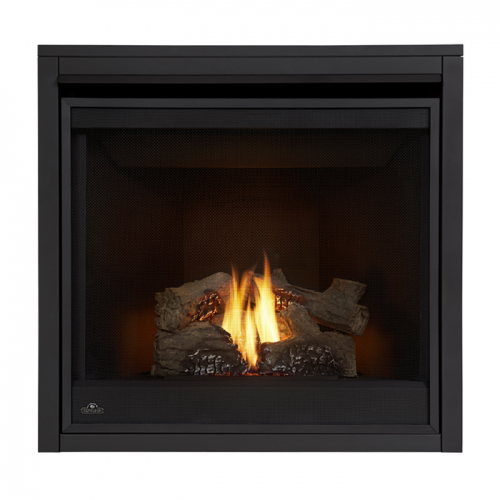 Our Napoleon B35 Ascent Builder Series 35" Direct Vent Fireplace will add warmth and visual appeal to any home or office. It's made by Napoleon, a leader in fireplace technology, so you can be sure the quality is great. This unit comes with the following standard features: glass door, Phazer(r) Log Set with embers, firestop and 20' wire, easily adjustable heat and flame control, and pan-style burner. This unit is approved for use not only in traditional homes but also for mobile home use. The B35 generates up to 20,000 BTUs of heat and is sure to keep you comfortable even when the winter chill is at its coldest. I have a 35 inch wide x 33 1/2 inch tall opening. What trim option do I need to cover the gaps? The TK 35 would work fine with your opening. What is the efficiency of this Napoleon Fireplace Ascent 35? Can the controls be moved? This unit has an AFUE efficiency rating of 72.5 percent. Per the manufacturer, the controls cannot be moved on this model. Ordered and received. Excellent customer service. Product came exactly as ordered. Easy install. ConsNo Cons for this product.